The DJI 9450 Thrust Boosted Self Tightening Propellers are an upgrade self-tightening propeller set, the 9450 set includes 1 x CW and 1 x CCW 9.4 x 5 self-tightening propellers which are designed to be used with the DJI Phantom 2 range including the DJI Phantom 2 Vision, Vision+ and the E300 Flamewheel F450 or F550 series. The motors from these systems have the correct thread types to fit the self tightening 9450 propellers. Please note if you don't have these motors, these propellers will not work, they have to have the CW and CCW threads on the motors. The 9450 propellers have low vibration & a low inertia which means that the flight responce is crisp and there is no vibration effects found on video footage. The impoved design and profile of these propellers allows for an increase in lift, an extra 100g over the original 9443 props. The increase in lift means that there are longer flight times to be found, most users report up to an additional 2 minutes from just changing to these propellers on their current setups. Awesome blades and as always excellent customer service by BYOD team. 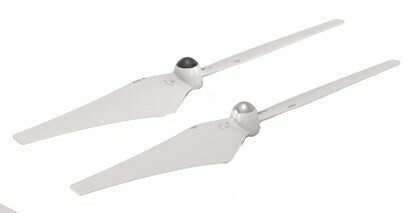 Using these propellers on my hexacopter. These props are fantastic. More control, better stability and a slight increase in flight time. What else do you need to know? Had two sets of these from BYOD and arrived very quickly! My only critique, would be good to have a choice of colour, DJI Phantom white is a tad garish. I searched the internet for the best price for the original DJI 9450 Propellers, BYOD were the cheapest, I have used the item today after breaking my last set that came with the drone. i can confirm the new props did not disappoint. they took my phantom 2 up and away smoothly as they should, after reviewing youtube it advises to avoid the cheap replacements as they are not balanced correctly. these purchased from BYOD were genuine parts and worked perfectly. the props arrived on time as promised. fully recommended. Good stuff and fast too!